Currently seeking funding on Kickstarter, C.H.I.P. is a tiny, super-cheap, surprisingly powerful computer. In a package small enough to fit in the very small palm of a very small hand, C.H.I.P. packs a 1GHz processor, 512MB RAM, 4GB of storage, and has built-in WiFi and Bluetooth. 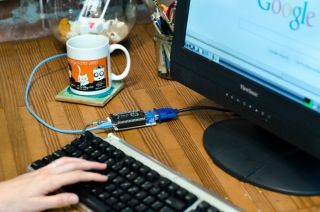 The tiny computer runs mainline Linux, and thus can access thousands of open source apps such as LibreOffice, Chromium, and more. It's also only $9 — putting the $35 Raspberry Pi 2 to shame. C.H.I.P. 's creators asked for a modest $50,000 on Kickstarter, which doesn't seem like much to kick off mass manufacturing of a compact computer. Good thing for them, then, that the crowdfunding campaign has already raised more than $700,000 in five days. The first run of barebones C.H.I.P.s will head to backers in December of this year, with the full run expected to ship in May 2016. That's if everything goes according to plan, of course. Hardware Kickstarters are perilous things. Sometimes they don't pan out, but if you want a tiny computer that looks good next to a banana, $9 isn't too much money to risk.